When parents complain that they struggle with poor light in their photos, usually it’s because they are taking photos indoors without much natural light. Without natural light, such as at bedtime, your best bet is often to convert to black and white. I get it! Much of life, especially if you aren’t home with your kids during the day, happens in poor light. And once again, while our eyes know how to adjust, our cameras, especially our smartphones, do not (your DSLR out of auto mode is much better equipped to handle low light). This contributes to the disconnect you may have been feeling between what you experienced and what your photos show. Without natural light, your smartphone photos (and even your DSLR photos) are never going to have the same brightness, color and clarity that your natural light photos have. But you CAN maximize whatever light you do have. To do so, we are going to get a little technical, because while you don’t have a lot of control over your camera settings on your smartphone, you do have some. Use “tap to focus” to control where your smartphone focuses in the photo. This is a good tip to use under any circumstances, but it can be particularly helpful when you don’t have much light. Increase your shutter speed. Yes, that’s right, you can actually control your shutter speed on most recent smartphones. What you will want to do is increase your shutter speed to at least 1/30 of a second, but preferably 1/125 or higher. This way you will avoid the motion blur that makes so many photos in low light unusable, no matter how emotionally good they are. This does mean that your photos may come out a little dark - but we can fix that in editing, which we will cover next week! Whether you increase your shutter speed or not, your photos will likely be a little grainy. I like to say "embrace the grain" - it can be quite beautiful, especially if you convert to black and white. How do you control shutter speed? For other devices, google “shutter speed” along with the name of your device and likely some recommendations will pop up. If you have difficulty, post in the Facebook group and we’ll help you out as best we can! Unedited photo - yes, I really did take a photo this dark! 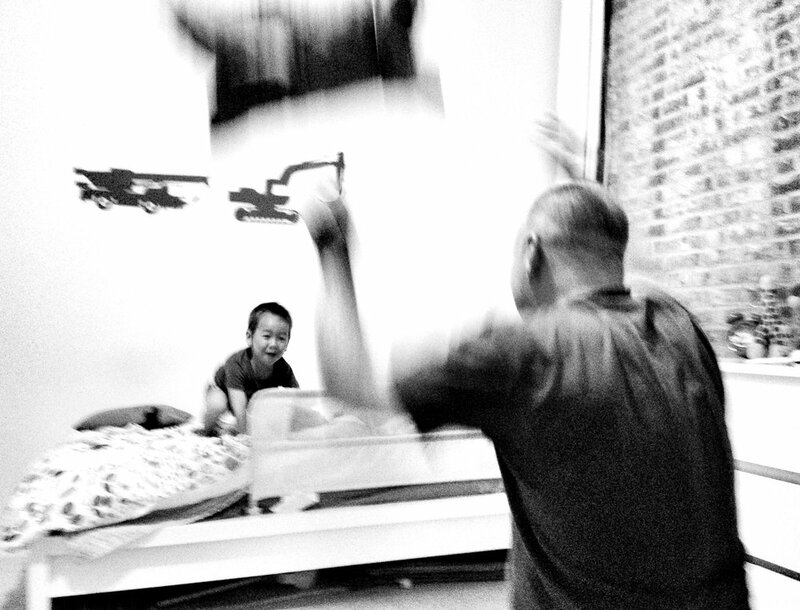 You can use a slow shutter speed to your advantage to capture motion such as during this pillow fight. Or to capture kids in motion. Here I kept my camera still so my child was blurred. Here I moved my camera with my kids so the background was blurred. Another grainy favorite from when Jack was a newborn. Dreamy. Your DSLR will handle low light much better than your smartphone if you know how to adjust your settings. We cover this in detail in The Photosanity Intensive on using your DSLR. The campfire was a good source of light but this was still at ISO 12,800, 1/160 at f/1.8.